Our range of products include Hydro Testing Pump, Electric Driven Hydro Test Pump, Hydro Static Pressure Test Pump, Electric Hydro Pressure Test Pump, Electric Hydro Testing Pumps and High Pressure Hydro Test Pump. We are manufacturing, exporting and supplying quality based and wide variety of engine and electric driven hydrostatic test pumps and equipment's to our customers. 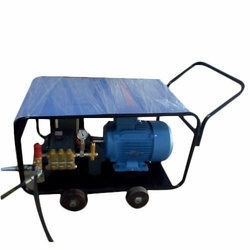 We, at REN JETTING ( Group Of SSH) supplying Hydro test pumps and equipment which are suitable to portable use and can well be used to test the irrigation lines and perform high pressure hydro test of tubes, pipes, hoses, cylinder, Hydrotest of pressure vessels boilers, hydro test pump of cross country pipe lines, valves, castings, components etc. for leaks or defects. An ideal partner for managing and powering the performance of businesses across the globe, REN JETTING is committed to meet customer requirements and aims to manufacture products that can empower the industry, serve the clientele, as well as result in mutual growth. 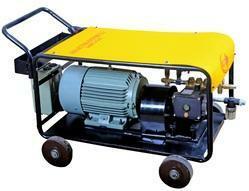 We are manufacturing, exporting and supplying quality based High Pressure Hydro Jetting machine to our customers. these equipment is used to clean boiler and condenser tube and hydro blasting purpose. Heat exchangers used in industry are prone to scaling blocking which drastically reduces heat transfer efficiency of the process. High pressure water jetting is the fastest most efficient method of cleaning internally externally.An ideal partner for managing and powering the performance of businesses across the globe, REN JETTING (Group Of SSH)is committed to meet customer requirements and aims to manufacture products that can empower the industry, serve the clientele, as well as result in mutual growth. We are manufacturing, exporting and supplying quality based Hydro Blasting Machine to our customers. these equipment is used to remove rust and dust, and hydro blasting in the ship repair marine industries, vessel and tank cleaning. An ideal partner for managing and powering the performance of businesses across the globe, REN JETTING (Group Of SSH) is committed to meet customer requirements and aims to manufacture products that can empower the industry, serve the clientele, as well as result in mutual growth. We are manufacturing, exporting and supplying quality based and wide variety of engine and electric driven hydrostatic test pumps and equipments to our customers. We, at REN JETTING ( Group Of SSH ) supplying Hydro test pumps and equipment which are suitable to portable use and can well be used to test the irrigation lines and perform high pressure hydro test of tubes, pipes, hoses, cylinder, Hydrotest of pressure vessels boilers, hydro test pump of cross country pipe lines, valves, castings, components etc. for leaks or defects. An ideal partner for managing and powering the performance of businesses across the globe, REN JETTING is committed to meet customer requirements and aims to manufacture products that can empower the industry, serve the clientele, as well as result in mutual growth. 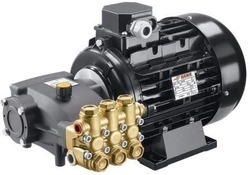 SSH is the company has started the vision to provide best quality products with competitive price, Our Group of company having more than 15 years of manufacturing experiences of High Pressure Pumps. REN JETTING SYSTEMS LLP (Group Of SSH) is the Authorized Channel Partner of UDOR/HAWK Pumps – Italy, REN JETTING SYSTEMS LLP specialist supplier of standard and custom-made High-pressure water jet cleaning systems and Vacuum Cleaning Systems to Indian Industry. 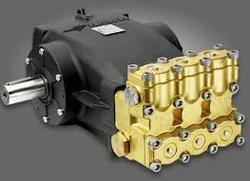 Suppliers complete packages to the customer as per the customer requirements. 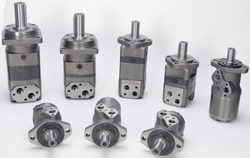 We supply compact and efficient WHP Type Hydraulic Motors at highly competitive prices to our customers. The assembly comprised of a cylinder block with radically positioned cylinders, pistons and distributor valve for regulating the flow of fluid to & from the cylinders that are in operation. 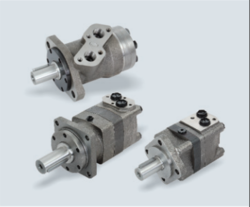 We are Manufacturers ORBIT Make Hydraulic Motor Model no of ORBIT Hydraulic Motor is as Under. Shree Saikrupa Hydraulics Gujarat Pvt. Ltd" (SKPL) is the importer, exporter, distributor & manufacturer of Hydraulic Motors, Monoblock Control Valves, DC Power Packs , HIGH PRESSURE PUMP, HYDRO BLASTING, HYDRO TESTING, PRESSURE JETTING, HIGH PRESSURE CLEANING SYSTEMS, CAR WASHER, HYDRO JETTING EQUIPMENT, TRIPLEX PLUNGER PUMP Incorporated in the year 2005 with the aim of providing an exhaustive range of hydraulic components under one roof, SKPL stocks the hydraulic products for various leading international manufacturers. With warehouses and sales engineers in different places in India SKPL is India's one of the largest sales net -work company in hydraulics which cover the all major cites across the country. 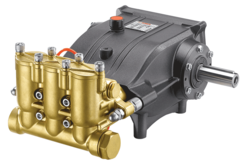 SKPL is a one-stop-shop for the complete range of hydraulic products including Pumps, Motors, Valves, AC & DC Power Packs and accessories. REN JETTING SYSTEMS LLP, Is one of the leading jetting equipement manufacturer in India. We are sell Hydraulic Product and service provider of major city in India.Mumbai, Bangalore, Chennai, Ahmedabad, Delhi, Kolkata, Haryana, Gurgaon, Coimbatore, Bhopal, Rajkot, Vapi, Daman, Nagpur, Aurangabad, Mangalore, Jharkhand, Punjab, Gandhidham, Uttrakhand, Orissa, Hyderabad, Bharuch, Ankleshwar, Gujarat, Madhya Pradesh, Jaipur, Rajasthan, New Mumbai, Surat, Baroda, Vadodara, Pune, Chandigarh, Ludhiana, Indore, Goa, Vizag, Vishakhapatnam, Nashik, Ernakulam, Kolhapur, Maharashtra. Andhra Pradesh, Arunachal Pradesh, Assam, Bihar, Chhattisgarh, Goa, Gujarat, Haryana, Himachal Pradesh, Mizoram, Jammu & Kashmir, Jharkhand, Karnataka, Kerala, Manipur, Meghalaya, Nagaland, Orissa, Sikkim, Tamil Nadu, Tripura, Uttar Pradesh, Uttaranchal and West Bengal. Andaman and Nicobar Islands, Chandigarh, Dadra and Nagar Haveli, Lakshadweep and Pondicherry, Umbergaon, Silvassa, Mehsana, Lucknow. Kanpur, Thane, Bhopal, Visakhapatnam, Patna, Bihar, Ghaziabad, Agra, Faridabad, Meerut, Vasai-Virar, Varanasi, Dhanbad, Amritsar, Navi Mumbai, Allahabad, Ranchi, West Bengal, Jabalpur, Gwalior, Vijayawada, Jodhpur , Madurai, Raipur, Chhattisgarh, Kota, Guwahati, Solapur, Hubballi-Dharwad, Bareilly, Moradabad, Mysore, Jalandhar, Tiruchirappalli, Bhubaneswar, Trivandrum (Thiruvananthapuram), Bhiwandi, Saharanpur, Gorakhpur, Guntur, Bikaner, Amravati, Noida, Jamshedpur, Bhilai, Cuttack, Firozabad, Kochi (Cochin), Dehradun, Asansol, Nanded, Kolhapur, Ajmer, Jamnagar, Siliguri, Jhansi, Sangli-Miraj , Belgaum, Mangalore, Tirunelveli, Jalgaon, Udaipur, Akola, Bokaro, Bellary, Patiala, Agartala, Dhule, Rohtak, Bhilwara, Ahmednagar, Thrissur, Hisar, Panipat, Karnal, Bathinda, Rourkela, Puducherry, Umbergaon, Silvassa, Mehsana. Hydro blasting, hydro testing pressure cleaning, car washer, automatic car wash, triplex pump, triplex plunger pump, high pressure cleaning.